Don’t make “overwhelm” into a noun. I remember when overwhelm was used to describe a feeling, or an action. Did you ever read a sentence such as “she felt overwhelmed by emotion”, or “The army attacked with overwhelming force”? it’s a powerful word, to be sure, but by its nature it describes a momentary situation, a passing phase. Isn’t it time we put this word back into its proper place, an excellent descriptive word used to describe a time of intense feelings, a time that will pass. Think about the last time you felt overwhelmed by circumstances, and remember when that feeling passed, and how much calmer and lighter you felt. 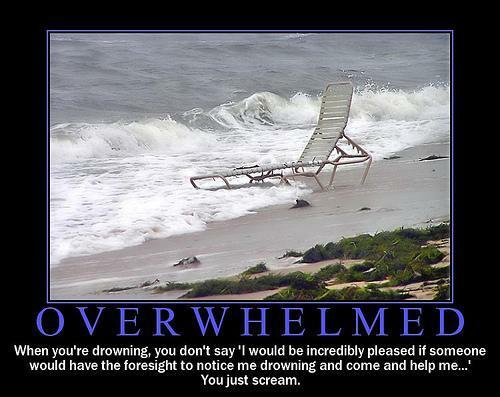 Now that you have remembered that feeling, it will be so much easier not to make “overwhelm” into a noun! If you need help coping with overwelming feelings, contact Jane to book your free focus session.